… A rather obvious title for this post, but if you lived with two Beatles-obsessed children, as I do, you would forgive me. 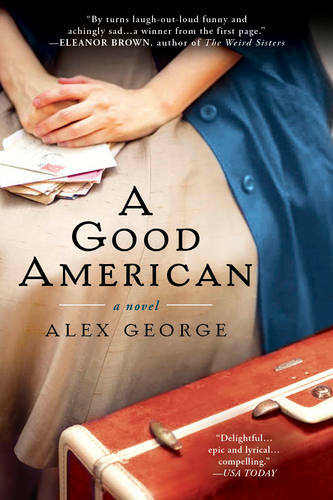 It’s difficult to believe that it’s been nearly a year since A GOOD AMERICAN was published. In the past twelve months I have visited wonderful bookshops across the country, been invited to literary festivals, done countless radio and TV appearances, and spoken to scores of book clubs, both in person and via Skype (the furthest away being Abu Dhabi.) And I’ve signed God-knows-how-many actual books. The novel has sold very handily in the US (and, if amazon is to be believed, also appears to be a bestseller in Italy and Spain.) It was named one of the best books of 2012 by Library Journal and BookPage. Best of all, during the past year I have met hundreds of fantastic people – booksellers, writers, and readers – many of whom I am now proud to call my friends. I got word last week that pre-orders have been healthy enough that they have already had to go back for a second printing, which is wonderful news. There is in fact some more great news about the paperback, but I am under strict instructions not to share it just yet. (Soon, I promise.) I’m also delighted and proud to report that the book has again been named to the Indie Next paperback list for February 2013. We have some events lined up to promote the paperback launch – at present the plan is to stay relatively local, although as I discovered last year, these things can change very quickly. The first event will be at the Barnes & Noble in Columbia, at 7 p.m. on Thursday, February 7 – on the off chance that there is anyone in mid-Missouri who hasn’t yet heard me speak about the book, I’d love to see you there. As an added incentive, also in attendance will be a wonderful writer friend of mine, who will I am sure sign her brilliant and mega-selling novel for you, if you ask nicely. More details to come. I’ll also be reading at Left Bank Books in St. Louis on March 7, and am appearing at the American Booksellers Association Winter Institute, where the book has been chosen as the “one read” title for the convention. I’m really looking forward to meeting all the booksellers and authors who will be there. Finally, I just want to thank everyone who has been kind enough to get in touch with comments and praise (and criticism!) over the past year. I always say that writing books is a very lonely business, and it means so much when people take the time to write and share their thoughts. Pushing a novel out into the big, wide world is an exciting but often stressful experience; hearing from readers and friends makes it all worthwhile. So, please – keep in touch. Reprinting before it’s out is wonderful news, and definitely a testament to the story. It’s such an easy thing to share because it’s a story that matters to so many people, regardless of where they’re from. I know the people I recommended it to have recommended it to others. It’s been a hell of a year for you, and I hope the paperback release hooks those who don’t pick up hardbacks. Looking forward to the next book! Just finished A Good American. A very enjoyable read; lots of twists and turns and a most surprising ending! ps: Loved the cover picture. Really caught my attention.